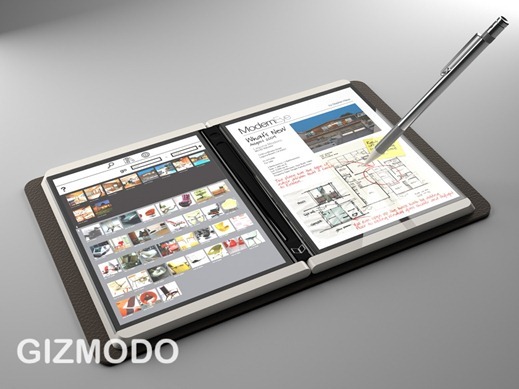 Gizmodo today took the wraps off the new “secret” Tablet PC concept that Microsoft has been working on. Currently called as Courier, it boasts off dual 7-inch multitouch capable screens which is designed to work with both multiple fingers-input and stylus. Courier which is said to be in its late prototyping stages looks incredible already! I hope Microsoft drops this before the rumored Apple tablet which is taking forever to happen. If Courier works as it is demonstrated in the video above then I’m surely sold to it. Let us know what do you think about it and whether or not you will prefer it over the rumored single-screen iPhone-like multitouch capable tablet which Apple is said to be working on. First off, this is a really cool looking prototype. Second, I would hearken to what others raise; namely, when will the real product ship and what’s the OS and tools side of the equation, as Apple has pretty much shown this to be the bar for success. Clearly, Apple learned this lesson from Microsoft (in PC 1.0) but MS feels long removed from those days (i.e., cultivating and growing a software centered ecosystem), especially in light of all of the legacy that they have to support. I hope that it is Windows 7 or Windows 7 embedded. XP, Vista, or CE will not be the best options for this product. I am including the video of the one handed SoftFrog on tablets and iPhone. These are both in Alpha stage, yet are working very well. Because the FrogPad IP is multi touch, we are using both multi touch and single touch technologies on our SoftFrog. FrogPad is a proven User Interface on one handed hardware.. I suggest that it can be an alternative/additional user interface for all Multi Touch applications. wow, I'm really looking forward to this device, I wonder if they currently have a physical device or just a 3d rendering? Well, OS is one part of it, but I believe this will be a platform play ala iPhone, and question there is whether MS can still rally the forces around a unified strategy, as they did many a times back in the days of Bill.